WhiztechJohn.com – …comments and opinions of a tech dude. Group interaction. You can communicate and keep everyone on the same page. Central location for information. All aspects of your project remain in one place. Track your project. Find out where you are at. Available anywhere on any device. The mobile version is outstanding and easy to use. If you are not using Basecamp 3 for your ministry, you need to consider using this to help your ministry move into the 21st century. Well this is he first post in quite a while. Just testing the posting power from the mobile version of WordPress. Have a great day and may God richly bless you. For whom and what do I make sacrifices? If I could have anything or experience what would that be? Who and what makes me the most happy? What one person or thing can I not live without? What do I think about when my mind is in neutral? So you either follow God who created nature or you follow nature as your god. There are no other options. Of course there are many “religions” but for the most part they point to “a” god who created everything. Those that do not believe in “a” god choose to believe that nature created everything around us (Romans 1:18-25). So here lies the internal conflict found in the movie that my son and I went to watch the other night, Deepsea Challenge 3D. The movie is incredibly well made (which is no surprise coming from the producer James Cameron). The visuals of the ocean life, the coastal land areas, aerial shots of the seashore are all breathtaking. The 3D filming is among the best I have ever seen. Watching the film I felt myself becoming absolutely sold on 3D film making which I had not been before. But there was something that spoke to me even more during the film that just made me sad.. denial. Denial that James Cameron had. All the amazing creatures that would fascinate him while he scooted around on the ocean’s floor some 27000 ft below the surface never caused him to acknowledge that God created any of it. I heard his admission that “nature” or “the ocean” created it. Something created it! Even atheists believe that! Be it evolutionary processes or what I believe in which is our loving Lord. The point is everything is HERE NOW. There is irrefutable evidence that we live among many different kinds of animals and life. James seemed to me to in denial of admitting that God made these things that he found so amazing and intriguing. 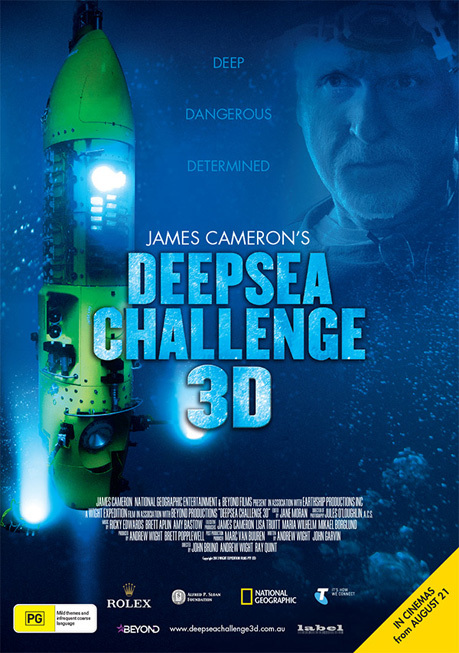 In fact the movie could have been renamed “Deepsea Challenge — the search for cool critters”. He would constantly become enthralled when he would find life at the bottom of the sea. The dust and sediment, rocks and other non-living features would bore him (which it does for everyone else). Which brings me to my point, “we are intrigued by things that are alive”. I am not going to get into the apologetic reasons why I believe that God exists and that He loved me enough to send His son to die on the cross for my mess ups. But I am going to say that it is NO mistake that we were built for relationships. We find that living creatures fascinate us. How they move, look, operate. James finds these creatures compelling and links them with the primary reasons for going to the depths of the ocean. In fact at the end of the movie in the credits the only things that are listed as “discoveries” are the living organisms that were found. Why? Because “LIFE” matters! Life on this planet makes it special among every other planet. It is the only place we know of that has life on it. Why do we find life so intriguing? Why is it so amazing? James does not know the answer to that question. He could propose that we had “evolved” this way. That nature caused us to wonder. Whatever he wants to label the creator of the universe it still does not hide the fact that there was a creator. We find life amazing and intriguing because we were created by God in His image. He finds life amazing, and intriguing. He wants us to live, not die. So why does James deny the true Creator of the universe? Why does he fail to acknowledge God? What is funny about the film is that even members of his own crew, which he hand picked to develop the sub, acknowledge there is a God to some degree. Even his own WIFE! When James reached the deepest spot on the sea floor, some 36000 ft below, his wife screams into the radio, “Godspeed to you James, Godspeed!” What does that mean to James? Well he does not even reply. What a shame. What a waste of time to go down there looking for these critters and only thinking that some imaginary force of order created them. What a failure to acknowledge the amazing creation that our loving and creative Lord built. Man… how I wish James would raise his white flag of surrender and just admit it! But he hasn’t, at least not yet. One of the most amazing filmmakers, explorers, leaders of our time. A man driven by the vision to explore and pioneer. Whether it be for curiosity sakes or to stroke his ego (probably a combination of the both), he was able to privately fund and build the most amazing deep sea vehicle ever made. Amazing. But worthless if the credit for this ability is not given to the One who bestowed it on him. What a waste of time to go down there and know in your heart that it is just so impossible that random chance or some unforeseen force of nature, or just sheer “luck” produced these incredible animals. James you are missing the best part of your life! Oh how I could imagine how much more exploration could be done with the attitude of acknowledging there is a God that loves us and wants us to know Him and His creation more! To be the stewards of His mighty work. James is still alive and still has a chance. A chance to live… I mean to REALLY live. To live with his white flag raised and acknowledge he finally settled it with God. I pray that happens and that if it happens you will see someone who explores with a purpose that is bigger than his own selfish desires. He goes to where no man has gone before for the purpose of showing people that this world deserves more respect than to acknowledge an unforeseen, impersonal, DEAD process called evolution made it. No this amazing place we live on deserves to be credited back to the One I call Jehovah who is ALIVE. The one who’s amazing creativity and generosity makes me ALIVE on this planet to live, love and worship Him. Purpose my friends is found only when you raise your white flag. I hope and pray that those of you who go to see this movie notice the absolute majesty in God’s creation. How superbly He has made everyone and everything. Please don’t insult Him by claiming it was all just a matter of chance. The Lord deserves the recognition He deserves. I remember a line from the Indiana Jones Movie “The Last Crusade” in which Indiana Jones is faced with making a choice as to what cup he should drink from in order to find the one that would heal his dying father. The villain of the movie chooses what he thought was the cup of Christ by choosing the most elaborate cup on the shelf. We soon find out that he chose “Poorly”. Well many of us know what happens to that guy in the movie and rejoice in the fact that Indiana Jones makes the correct choice and ends up saving his father. We to must remember that we have to make correct choices in life that impact how we will live. The Bible says, “I will set nothing wicked before my eyes;” in Psalm 101:3 (KJV). What does that mean? Philippians 4:8 says, “Finally, brethren, whatever things are true, whatever things are noble, whatever things are just, whatever things are pure, whatever things are lovely, whatever things are of good report, if there is any virtue and if there is anything praiseworthy—meditate on these things.” (KJV) We are to be Holy as He is Holy (Leviticus 11:44) We are to be like Christ (Philippians 2). It in fact says in the Bible we are to be PERFECT as HE IS PERFECT (Matthew 5:48). It looks to me that we better be careful as to what we put before our eyes and allow to enter our minds. As the old saying goes, “We are what we eat.” If we are “eating” things that are evil, wicked, or opposite of what Philippians 4:8 tells us, then why do it? Why do we need to put that into our minds? Why do we need to watch that TV Show? Why do we need to watch that Movie? Listen to that music? Read that book? The answer is we don’t have to. Speaking with a group of friends this last Saturday night, we embarked on a side subject of recent TV shows. “Breaking Bad” and “The Walking Dead” came up as some of their favorite shows. I asked the question, “Why?” Most of them answered saying they enjoyed the story or the “Killing of zombies”. This discussion finished the evenings study as I felt the Holy Spirit leading us to ask the question of “Why?” I have never watched “Breaking Bad” and wondered why everyone was in such a up-roar over the finale. Seems this show is about a guy who ends up becoming terminally ill and has no money. So he begins to manufacture drugs and starts to sell them to create the “nest egg” for his family. From there I guess the guy just keeps going down the slippery slope of moral relativism by killing people in the name of “what I need for my family”. To me I can’t help to wonder why anyone would want to watch a show that portrayed someone who is evil and doing nearly everything wrong as the “Good guy?” My friends told me that in some episodes the torture and violence was so great that they had to turn it off. Now mind you this is on regular network TV. The same is true for the show “The Walking Dead”. Why? Why would you want to fill your mind with images that portray things that satan himself finds entertaining? Why would you continue to watch Miley Cyrus videos? Jay Z videos? Well, just about any music video now-a-days? If God has called us to be salt and light, then we need to be that. We don’t need to be doing what the rest of the world is doing. In 1 Corinthians 9:19-23 Paul speaks about becoming everything to all men. In verses 19 – 20 he talks about becoming a “Jew to the Jew” and then “A Greek to a Greek”. But in verse 21 he speaks about becoming like those without the “Law” BUT qualifies that by saying, “though I am not free from God’s law but am under Christ’s law”. Paul says that He still has to honor what Christ has told him to do. As Christians we must try and do our best to honor what we have been told to do. I believe it is time for all Christians to stop allowing the propaganda machine of TV, Movies and News brain washing us into what it wants us to be. The desensitization to all things that are against God is on us and they aren’t holding back until they make us an un-godly, un-civilized society responding to everything that comes our way with an animalistic, reactionary engagement. We wonder why there are so many people going insane and engaging in shooting rampages across America seemingly on a weekly basis, but claim that 1st person shooter video games have nothing to do with it. WE TURN OUR EYES FROM THE TRUTH BECAUSE IT DOESN’T FIT WHAT WE DESIRE. People, that is the same thing that got us in this predicament in the first place. Adam chose to do what HE WANTED verses WE HE KNEW WAS TRUE. It is abundantly clear that it was a choice. Adam chose poorly. For his poor choice God’s only Son had to die to save us from his decision. I challenge you today to make the choice to STOP filling your minds with evil/detestable things and start filling them with things that are TRUE, HONORABLE AND JUST. We are the light to this world. We are Jesus to the lost. They are watching us…very closely. It is how we live that speaks to them about the validity of our faith. Let’s make today count and the rest of our days count for the God that loves us and died a costly death for us. I am thankful for what the Lord had done for me last week. On a very very rainy, dreary day last week after a large tropical system had dropped nearly 4″ of rain I receive a call from around 3 PM from my wife. She tells me that there is no water at home. Several things go through my head, but I try and have her check the circuit breakers to see if any had tripped. None had. So I decided I had to come home and check to see what has happened. I get home and drive back to the pumps through the soaked mud ground. I can see nothing from sight that there is anything wrong with the pumps. So after parking my truck, which BTW I was supposed to be servicing that evening, I get my tools and take the back of the motor housing off of the pump. Nothing wrong here. Stumped I remove the pump by undoing the removable pump fittings I had put on several weeks ago (one of the best decisions I have made). Setting it up in my shop I find I can get it to buzz, but not start. I tear into it more and still can not find anything wrong. I finally decide that the starting winding on the motor must be fried. After looking at the windings I do find that something has happened on the backside of the motor. It looks like it has been fried by something. I remember the night before and a large lighting bolt striking very near to our house. I believe it fried the motor. Bummed, my son and I venture to my dad’s house and see if he has any motors that I could swap as the pump housing of my pump is perfectly fine (and also perfectly fitted for my well pump piping.) 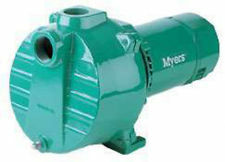 After grabbing a pump that I “think” may work from my dad, we head to Home Depot and proceed to purchase a $300.00 pump. We head back home and stop by by neighbors house to see if he has any pumps that work. After looking at their computer while my neighbor checks for old pumps he has laying around we determine that all of his pumps are too small. All to be had were 1/2 HP pumps and I needed a 1 1/2 HP. So, we head back to home and proceed to install the new pump. But, I decide to take one more look at my old pump to see if there is anything I can do. I prayed to the Lord mind you before we went searching for the new replacement pumps but did not see any fruit from those prayers, until now. When I began to test the windings of the motor I noticed that the starting winding was lacking continuity. I knew there must be some break in the wire, but where? So I decided to tear the windings apart thinking that I had nothing to lose if I broke the motor more. After digging a little while, bam, there it was! Praise the Lord! I proceeded to strip the varnish off the ends fo the wire and twisted them together. I put the motor back together and it start up! Praise Jesus! After taking it apart again to insure that the connection I made by twisting was secure (soldering them did not work for some reason), I tucked the windings I tore apart and secured them with some black silicone. Well fast forward about 1 week and it is still pumping like a champ. Man, I am glad God helped me in this! So “Thankful” for His great provision. I hope it holds out for many more years. 18 “If the world hates you, be aware that it hated Me first. 19 If you belonged to the world, the world would love you as its own. However, because you do not belong to the world, but I chose you out of the world, for this reason the world hates you. 20 Remember what I told you, ‘A slave is not greater than his master.’ If they persecuted Me, they will also persecute you. If they obeyed My word, they will obey yours too. 21 But they will do all these things to you on account of My name, because they do not know the one who sent Me. 22 If I had not come and spoken to them, they would not be guilty of sin. But they no longer have any excuse for their sin. 23 The one who hates Me hates My Father too.